TIREE: now 2 drake Green-winged Teal – 1 at Loch Bhasapol again and a new bird at Loch a’ Phuill. Also a juv Glaucous Gull at West Hynish, 1 Mistle Thrush at Mannal and 8 Pink-footed Geese at Cornaigmore. There was also juv Glaucous Gull at The Reef late yesterday (John Bowler). MID-ARGYLL: the juv Iceland Gull was back at Eilean Traighe, Ormsary today (Stu Crutchfield). 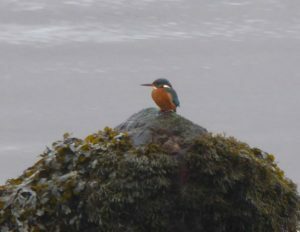 A Kingfisher brightened up a dreich afternoon at Airds Bay, Taynuilt (Mike Harrison). NORTH ARGYLL: A Grey Wagtail was feeding in a cattle field near Ardchattan this morning (Mike Harrison). No sign of the recent Little Egret at Loch Laich, Appin however a juv Iceland Gull was there (David Jardine). Kingfisher – Airds Bay, Taynuilt 17 Jan (Mike Harrison).